"Personal Data" is any data that identifies you. Securing our customer’s information is our number one priority the Personal Data which you supply to us you agree will be true. Jamaicaembassy.us will not sell, distribute, reveal, or compromise any of our customers’ information such as name and address, telephone number, fax number, payment information (e.g., credit card number and billing address). Personal Data which are only collected when our consumer’s register at our site via email providing us with necessary information, will only be processed and used by Jamaicaembassy.us for the purposes of providing the requested services to you and the other purposes mentioned below. Personal Data will not be processed or used to any other organizations. The use of information will remain under the control of Jamaicaembassy.us at all times. We only send emails to you about new services which we consider may be of interest to you only if you have given us permission to do so. Your personal data will only be disclosed on an anonymous and aggregated basis not in a way in which you will be identified. We declare that we don’t set any cookies at our websites programming systems. Beside that we declare that we are nor participating with any Ad servers. 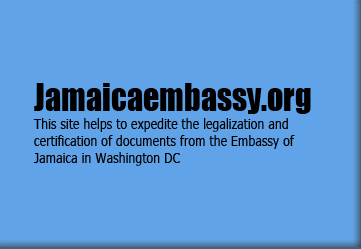 Jamaicaembassy.us ensures your documents safety by providing the online tracking service that enables you to monitor your documents location and statues. We may hold Personal Data relating to the transactions you enter into with us or others through Jamaicaembassy.us. We will disclose Personal Data to a party to the transaction, but only to assist your transaction. Your credit card numbers or any relevant information are necessary for us to accomplish your request and once the transaction completed we won’t reuse its data under any circumstances.